Once again, I find myself back at the the pipe organ in the Old Dutch Church in Sleepy Hollow. This time Jonathan Kruk and I will be performing “Dickens’ Christmas Carol”. For this event, not only will I be playing the pipe organ, I’ll also be playing the harp, fiddle, chimes and chains (for sound effects). Before each show, I lead the audience in Christmas Carols. It’s a lot of fun! The majestic pipe organ at the Old Dutch Church in Sleepy Hollow. From here you can see both pipe chests. I’m cleverly hidden behind the smaller one and in front of the larger one. Sure it’s mid August, but I’m already looking ahead to October when Jonathan Kruk and I will be performing Washington Irving’s “The Legend of Sleepy Hollow” in the Old Dutch Church of Sleepy Hollow. While Jonathan will be out front captivating audiences, I will be upstairs in the choir loft with my back turned to him. I’m not being rude; I’m playing the organ. Two years ago when Jonathan and I first met to discuss the show, our original plan had been for him to do his performance while I played “spooky organ music” between shows. Over time however, we began to progress from a storytelling performance to a real theater piece, complete with an original organ score. Here I’m intently listening to Jonathan for music cues. The first year, I used the accordion for very quiet parts. And what an organ it is! No, it’s not original (the Old Dutch Church never had a pipe organ). 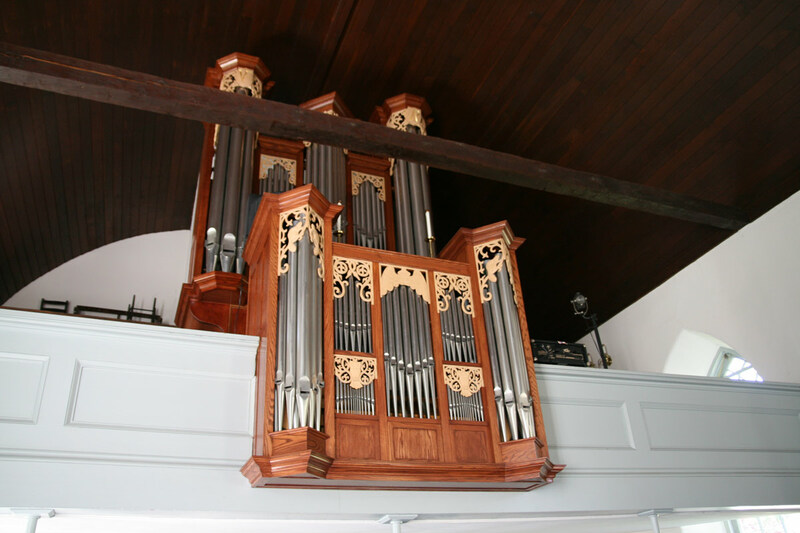 It was built by the Noack Organ Company with the look and stop design of a 17th century organ and dedicated in 1998. This is one serious instrument. And it’s a blast to play. So how does one prepare to play so much music on such an incredible instrument? This question bothered me a lot after our first run of “Legend”. My original thought was to find a home organ that I could practice on. 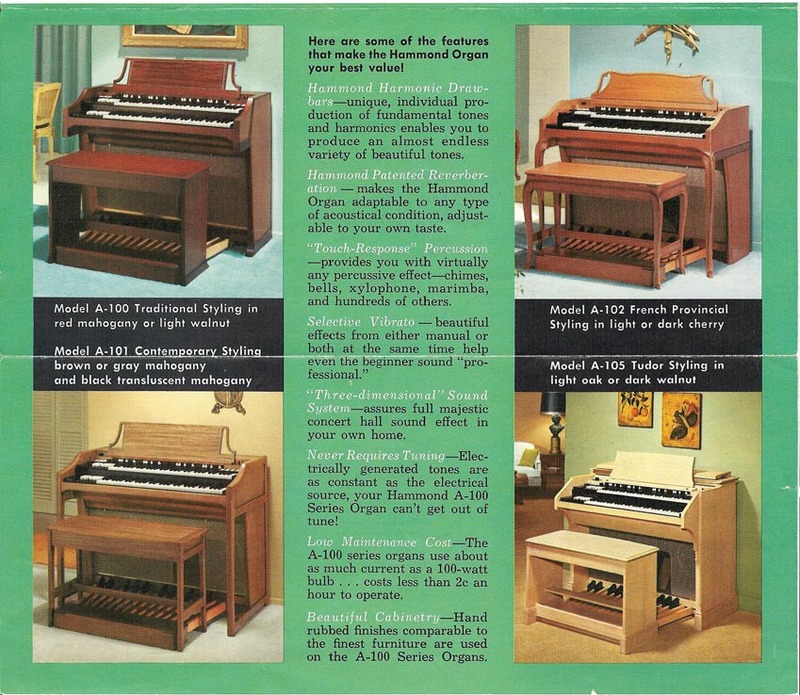 For a long time home organs were very popular, but in the 1980’s that popularity dropped. 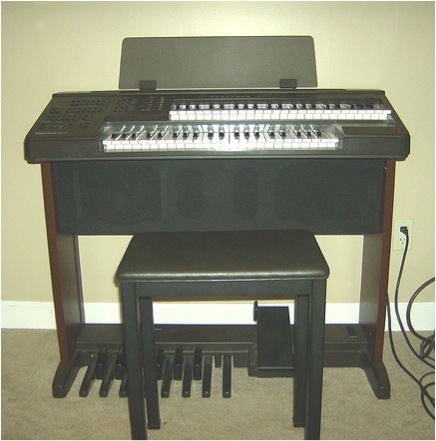 I got a used Yamaha organ for under $100.00 and got to work. What a let-down it was having gone from the mighty pipe organ to this! It wasn’t long before I exceeded the capabilities of the instrument. I needed something that had the same number of keys and pedals that the Noack organ had. That’s when I found the Hammond. The first organ I got for practicing the score. This little Yamaha also had very funky “auto play” functions. They were a lot of fun, but not especially useful. Any rock or blues fan has heard a Hammond organ. From Bob Dylan’s “Like A Rolling Stone” to Procol Harem’s “Whiter Shade of Pale” the Hammond B-3has made an indelible mark on popular music. What few people know is that Hammond also made a line of home/church organs and I was lucky enough to find one. 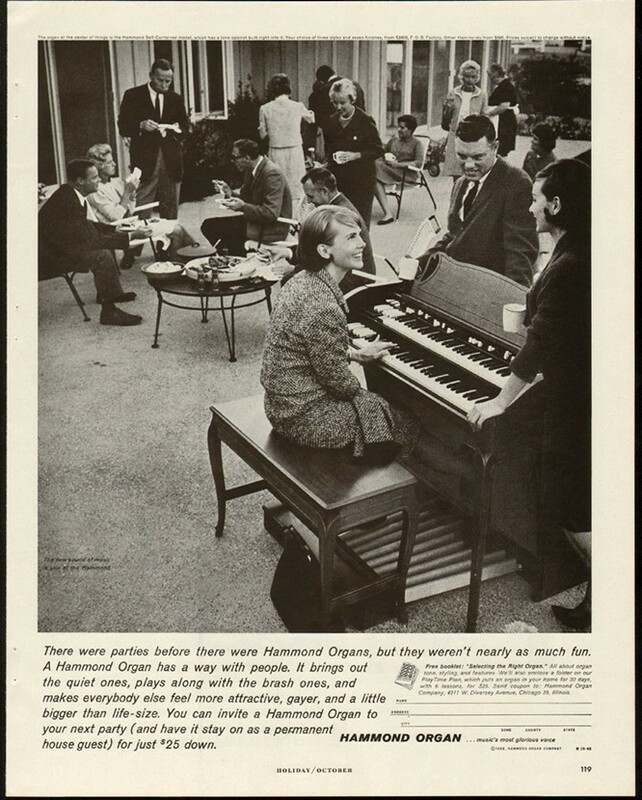 Here the Hammond A-100 was marketed as an instrument for the home. I have the mahogany one. Now this is just silly. Who’s gonna lug a 400lb organ out to the patio? My Hammond A-100 was made in 1959. It fits just inside a double closet in my studio. While not nearly as powerful as a pipe organ, it’s a lot of fun to play. It has two 61-key keyboards (which are called “manuals” in the organ world) and 25 pedals. What do the pedals do? They play bass notes. 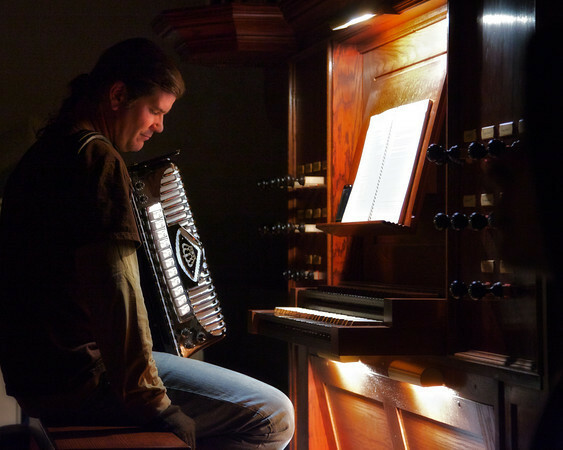 When playing an organ, you are using your feet and your hands. It keeps you busy. 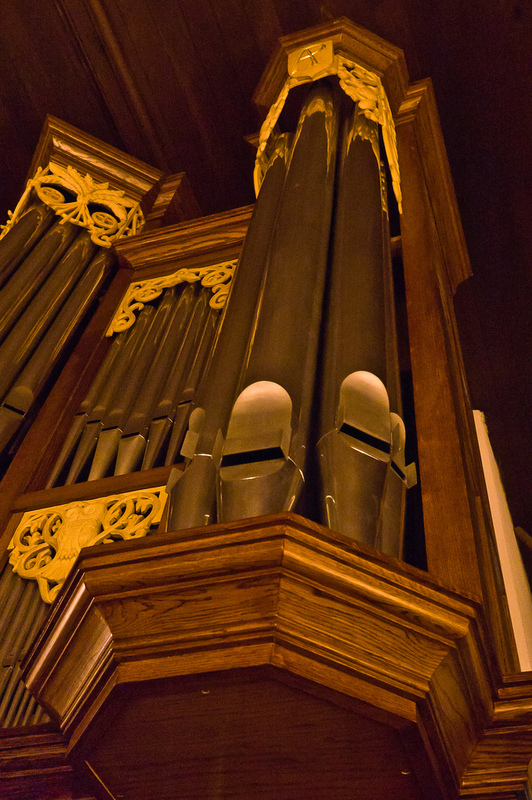 These are the 16′ pipes for the organ. They’re played with the pedals. You can really shake the building with these big guys.